Does Your Husband Wear A Wedding Ring? I remember a few months ago there was a discussion on a forum I am on and they were all talking about if your husband wore his wedding ring and if it would bother you. I actually put some thought into my husbands ring. And while it was nothing more than a simple gold band I actually had the inside engraved. It says ’10 years in the making’. We had dated for 10 years before we got married so it seemed really fitting. And you know what? He doesn’t wear it. Ever! In his defense he is a carpenter and working with tools all day everyday it ended up being too much of a risk to wear the ring. There are countless times in a day it could get snagged on something and he could very easily lose a finger. Not good! But then I started thinking. Is it possible that the ring choice was more of a problem then anything? I went classic. I went real gold. But real gold is often soft and can bend easily. And while it doesn’t bother me that he doesn’t wear his ring, I also wouldn’t mind if I could find one that he could wear everyday. 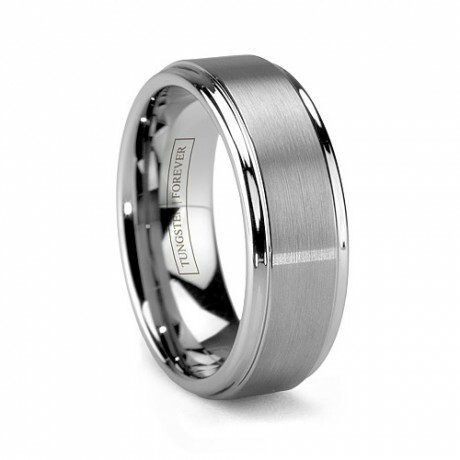 Our 10 year anniversary is coming up and I am thinking more and more that a Tungsten carbide men’s wedding ring from Tungsten World could provide the quality I am looking for. What kind of ring does your husband have? Does he wear it?